They look identical from the outside. And the similarity of their model names is unnecessarily confusing. But once you dig into the features and price, there are some significant differences. Here's how the GoPro HERO5 Session and HERO Session compare. They look identical from the outside. And the similarity of their model names is unnecessarily confusing. But once you dig into the features and price, there are some significant differences between the GoPro HERO5 Session and GoPro Session. Here's a detailed breakdown of how they compare. Firstly, it's worth clarifying this up front: The GoPro HERO5 Session and GoPro HERO Session are two different cameras. 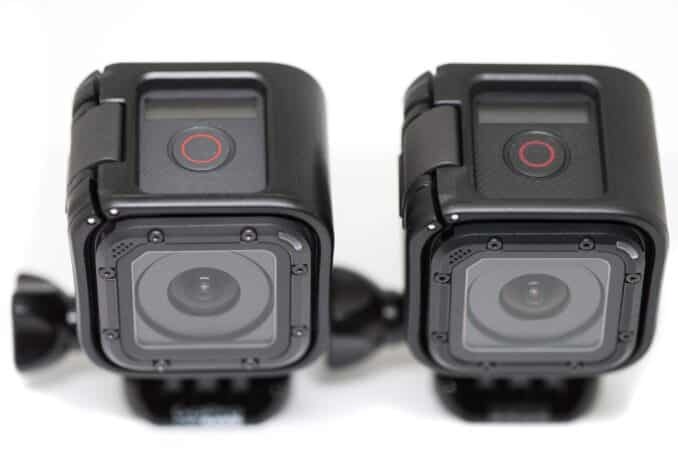 Both are current models; the old version was the HERO4 Session. Yes, it's unnecessarily confusing. The very short version of how they differ is that the HERO5 Session has more features and is more expensive than the HERO Session. The HERO Session is the basic, entry-level camera. 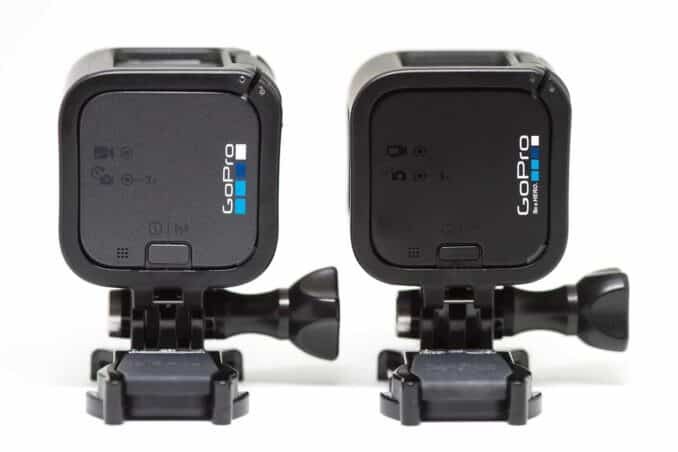 Secondly, it's also worth reviewing where these two models fit in GoPro's lineup, because that has a direct bearing on how they compare. As you can see right off the bat, they're both small cubes. Well, actually, they're not perfect cubes--one dimension is just a shade shorter than it should be for a perfect cube, but you get the idea. They look quite different to the traditional GoPro shape. 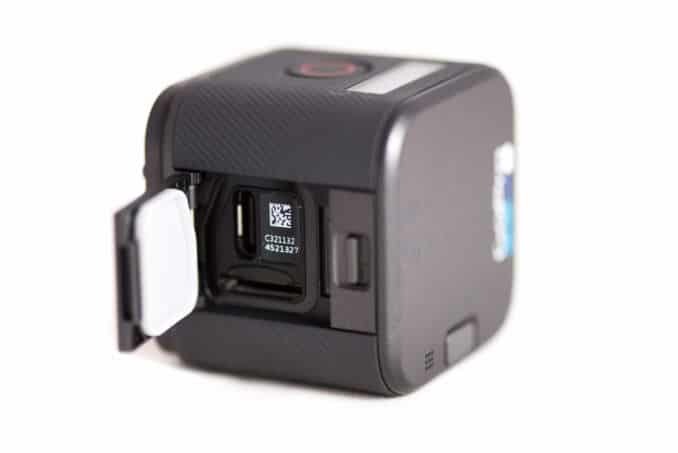 GoPro first used this cube shape with the HERO4 Session, a camera was launched in July 2015, about nine months after the other two models in the HERO4 range, the HERO4 Black and HERO4 Silver. (Actually, Polaroid was first with their Cube). 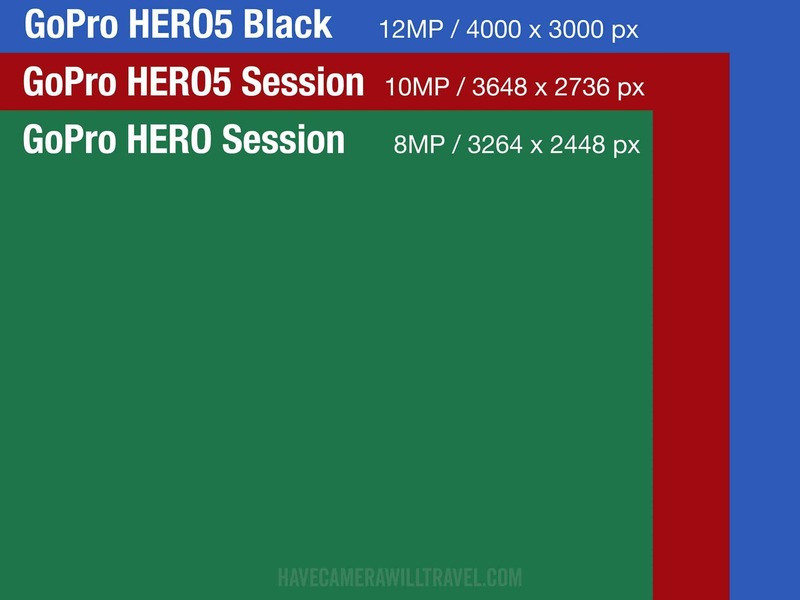 Despite being about half the size and weight of the Black and Silver, the HERO4 Session was a flop--it was overpriced and competed too directly with other cameras already in GoPro's range. 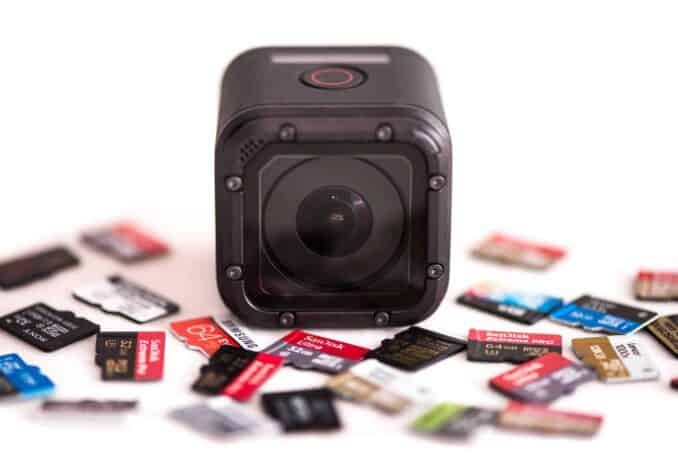 But the HERO4 Session gave GoPro the opportunity to branch out into the smaller form factor. The current HERO5 Session and HERO Session are both directly descended from the HERO4 Session. They share the external case and overall design. And in the case of the HERO Session, it shares even more. The HERO Session is the same camera as the HERO4 Session, just rebranded and priced at a much lower price point. So if you already have a HERO4 Session, you already have a HERO Session; so this post doubles as a comparison of the HERO5 Session with the HERO4 Session as well. 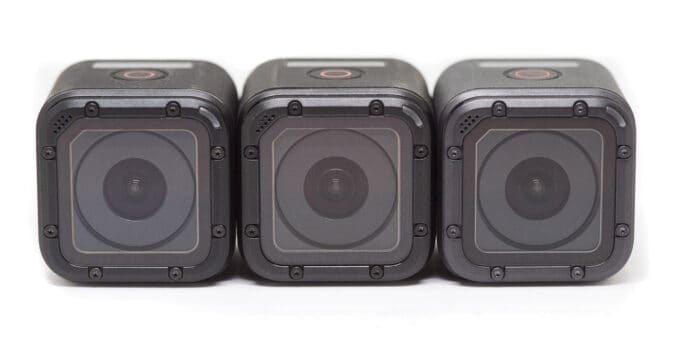 Left to right: GoPro HERO5 Session, GoPro HERO Session, GoPro HERO4 Session. The HERO5 Session, though, is a more powerful and feature-packed camera and falls between the HERO Session and HERO5 Black as the middle camera in GoPro's current range. I've found the battery life to be essentially the same. It's pretty much impossible to give a definitive figure when it comes to battery life because there are a number of factors that affect it. Things like leaving wifi and Bluetooth on, the resolution and framerate settings, using stabilization or GPS, and even the outside temperature (lithium batteries don't perform well in very cold temperatures). But as a general idea, I've run them side-by-side a few times in 1080p60 video mode without any other options on (that is, Protune, GPS, wifi, etc, all off) and they've been getting in the 1 hr 45 mins to 1 hr 47 mins range. If you turn on any of the other features you're likely to get less than that. But the gist is that I've not found that one has an advantage over the other in terms of battery life. And it bears repeating that the batteries in these models aren't removable--they're hardwired into the camera. For all intents and purposes, they're identical in terms of housing, ruggedness, and handling. Branding aside, there are only minute differences that make no functional difference, like a slightly different shade of black plastic and that the HERO5 Session has an every-so-slightly larger button on the back. Both models are the same dimensions and have the same built-in rugged protection. They're rated to be waterproof down to 33 feet (10 meters) without a separate housing. They both fit in the same frame. You'll need the frame if you want to mount your camera somewhere, because by itself the camera has no way to attach to anything else. GoPro HERO5 Session on the left, with a GoPro HERO Session on the right. They also have the same controls and most the same interface, with a large shutter button on top, a small power/wifi button on the back, and a very small monochrome text display screen on top. There are some minor differences between the text displays on top--the new version is slightly tweaked and has some refreshed icons, but they're not much different. Neither of them has the kind of LCD screen that the HERO5 Black or HERO4 Silver have where you can see what the camera sees. If you want to frame your shot with any precision you'll have to use the live view through the mobile app. By not having a back screen, having only two buttons, and having only a tiny two-line text display panel on top, the options for controlling the camera are pretty limited. GoPro's marketing department prefer to emphasize the simplicity of it--just push a button and go--but if you're looking to change settings or modes or it can get pretty tedious quickly. And you can't do things like format the memory card in camera. Thankfully, you can also control both cameras with GoPro's Capture app via wifi and Bluetooth. That's a much easier way to change a lot of settings at once. You can also use GoPro's Smart Remote. I have more details on GoPro stabilization here. Video Modes Compared. The HERO5 Session also offers a wider selection of resolutions and framerates. They includes 4K video, which the HERO Session doesn't have. Here's a master list of the video modes each camera offers. There's one minor difference in the way that the cameras describe their video modes. While the HERO5 models have SuperView and Wide fields of view, the Session refers to Super View and Ultra Wide. In the table below I'm treating the Wide and Ultra Wide FOVs as the same thing. Resolution. The HERO5 Session shoots photos at a resolution of 10 MP. The images measure 3648 by 2736. The HERO Session shoots photos at a resolution of 8 MP. The images measure 3264 by 2448 pixels. It also shoots a cropped mode with a Medium field of view with 5 MP photos. Here's how those sizes compare, along with the 12 MP images generated by the GoPro HERO5 Black. Burst Mode. The HERO Session can shoot in burst mode at 10 frames per second. The HERO5 Session offers more options, with up to 30 frames per second. Night Mode. This mode keeps the shutter open longer to allow more light to come in. The HERO5 Session has it; the HERO Session doesn't. GoPros have two methods of shooting timelapse (though not all of their cameras offer both methods, as in this case). One is the traditional method or shooting a series of still photos at intervals that you can then compile together into a video using software on your computer. It's known as Timelapse Photo. The other is known as Timelapse Video. Timelapse Video is far more convenient because you get a compiled video straight out of the camera, but Timelapse Photo gives you more control over the processing of anything from colors and contrast to resolution to framerate. The HERO Session can only do timelapse photo mode. It offers intervals of 0.5, 1, 2, 5, 10, 30, and 60 seconds. The HERO5 Session has the Timelapse Video modes. It offers the same intervals as the timelapse photo method. The video resolutions you can use are 4K, 2.7K4:3, and 1080p. Night Lapse Photo. This is a special mode that keeps the shutter open longer to let more light in and can adjust the interval accordingly to make it continuous. The HERO5 Session has this mode; the HERO Session doesn't have it. USB. Both use USB connections for charging and data transfer. That means they can be charged with regular USB chargers and external batteries as well as connected to computers by a cable. One thing to note, though, if you're planning to use external power, is that to access the connection you need to open the latch door, and with the door open the camera isn't waterproof. The HERO Session uses the older micro-USB connector for charging and data transfer. HDMI. Neither of these has HDMI output. The HERO5 Black does. Wireless. Both cameras offer wifi and Bluetooth connectivity that can be used for remote control via the mobile app Capture or with the Smart Remote. GPS. Neither of these cameras has GPS functionality. For now, that's limited to the HERO5 Black. Batteries. The batteries for both models are hardwired internally and can't be replaced. Voice Controls. This is something specific to the HERO5 models; the HERO Session doesn't have it. Voice control lets you issue basic control commands verbally, such as "start recording" or "take photo." It can be a little buggy, and there are a lot of situations you might not want to use it, but both HERO5 models have it. Both cameras are compatible with microSDHC and microSDXC cards. That means that both support cards ranging from 16GB to 256GB and above. The HERO5 Session supports 4K video capture, so it has higher demands of the memory card's write speeds. You don't necessarily need the fastest microSD card, but you do need one that's fast enough. I have a separate post on recommendations for memory cards for the HERO5 Session and HERO5 Black. Because the HERO Session doesn't record 4K video, it isn't quite as demanding on the speed of the memory card. Most of the current crop of microSD cards--especially those from well-known brands and sourced from reputable retailers--will work just fine. If in doubt, the SanDisk Extreme is a good choice. Both cameras can get quite hot, especially when recording longer videos at the higher framerate and resolution settings. The hottest part is the metal rim of the lens port, which can become hot enough to be uncomfortable to hold. The GoPro HERO5 Session's MSRP is $299. The Session's MSRP is $199. 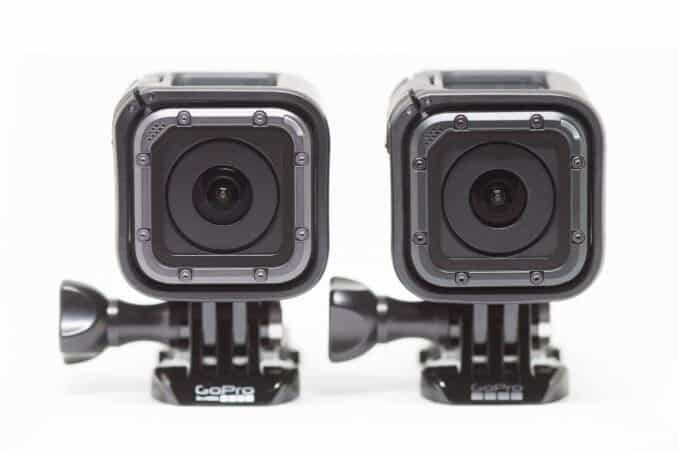 After some initial hiccups with production delays on GoPro's end, both of these models are now widely available at places like Amazon and B&H Photo. What’s best for skiing? Can you play back to watch on computer? Leaning towards GoPro session. There's not really anything about them that would make one better specifically for skiing. They're both the same size and will put up with the same amount of water and bumps. The HERO5 Session does have stabilization, which can mean that the footage that comes out of the camera is smoother and less jerky. It also has many more features, including higher video modes. But if you don't plan to use those higher modes anyway, the HERO Session is a little simpler to use (because it has fewer options to get lost in), usually cheaper, and still captures very good video. Yes, you can play back on a computer. You can also use the free GoPro mobile app to play back on a smartphone. Do both cameras have ProTune with the "flat" colors? So, the Session/Session 4 doesn't have EIS? Actually, Hero 5 and Hero 5 Session also got voice control. I have the session 4 and while recording mounted to my motorcycle helmet the sound is useless. It's supposed to switch between front and back microphones to assist with wind noise, but the Audio is unusable. Has the hero 5 session addressed this issue? Hi I was wondering whether to get the hero5 session or the hero4 session I will mostly be using it for filming motorbikes,cars and wakeboarding. It will be my first action cam. Both are same size and will give similar quality recordings. The newer model has some improvements on that front, by the HERO4 Session still produces very good quality. The newer model does have a couple of extra features that might (or might not) be things you'll find useful for these kinds of uses: built-in video stabilization and voice control. The stabilization works reasonably well but still has its limits. Here are some examples. The voice control is something I've been underwhelmed by, but there are people who find it useful, especially when your hands are otherwise engaged. The HERO5 models also have better integration with GoPros cloud services, which can be useful for uploading/sharing the footage. Yes, you can do that with the HERO5 and HERO6 models using the GoPro App. Hi! If you could tell me which should i buy for my first GoPro? I will using it on family vacations, waterparks, rollercoaster, etc etc. Also for recording live soccer game matches. Any suggestions? For that kind of general use, the ones with the back screen are probably good places to start if only because you can see what you're shooting. Neither of the two on this page have back screens, but the HERO5 Black and HERO6 Black models do. 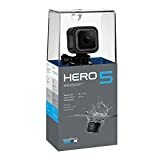 You can find good deals on the HERO5 Black at the moment, and GoPro permanently reduced their recommended price of the HERO6 Black in the lead-up to Christmas. Hi, I am looking for one of these two cameras and will be mainly using it for water sports (wakeboarding, waterskiing, surfing etc.) and am not sure which one would be the best but I am leaning towards the hero 4 session just because it is quite a bit cheaper? Is the hero 5 session worth the extra $100-$150?? Assuming you don't need the 4K or 2.7K video modes (and if you do, there's no real contest between them because only one has them), on feature you might find useful is the HERO5 Session's built-in stabilization. It works quite well, but it isn't perfect and probably isn't going to completely smooth out footage you'd get with those kinds of very active water sports with a lot of movement. Thanks heaps! Now I am more leaning towards getting the Hero 5 Session as I also do a little bit of Mountain Biking and the built-in stabilization would help immensely. The in-camera stabilization of the HERO5 models works quite well, although it's by no means perfect. I've put together some examples. It's convenient in that you get smoother footage right out of the camera. You can also get good results from editing software. That does give you more control, ultimately, but it also takes more time and effort. And if you prefer to use a third-party stabilization plugin, there's added cost for the good ones. hi comparing current gopro models and trying to decide which one would be best for bodyboarding and surfing. any thoughts on this? i may occasionally take a photo, but it will be primarily used for video footage. ideas/suggestions? Overall, there's not a lot in it for that kind of use unless you want/need the higher-end video modes. They both use the same mounts and have the same waterproof rating and they're the same size, so there's no difference in the way you'd mount them. For me, the in-camera stabilization on the newer model might be the deciding factor. It's by no means perfect--I have some examples here--and I haven't specifically tested it on the type of movement you get on a wave, but I suspect you'd often end up with smoother footage that's easier to watch without going to the trouble of doing it in post-processing. One other potential decider might be the voice activation of the newer model. I've generally been underwhelmed by how well that feature works in real-world shooting, but it might come in handy if you want to stop-start filming mid-wave. I can't decide which one of these I should go for. I have some travels ahead and I want nice and breathtaking photos/videos, better than taken only on my phone (huawei p8 lite) which I used so far. I also want camera that will last for few more years because I don't want to invest in it every two years. I dont know if I should go for cheaper version (Gopro session), I guess for my instagram pictures it will be enough, but what if the camera (i mean quality of pictures) will not be current in future few years? I'm not sure there's a right answer here. Any camera you buy today will presumably (and hopefully) still be taking great photos for several years to come. So if you don't need to keep up with the latest and greatest, there's not necessarily any need to upgrade as often as the camera manufacturers want us to. And while the HERO5 Session does offer some improvements over the HERO Session, most of them are to do with features rather than image quality. I have a post specifically on using a GoPro as a travel camera that might be of interest. Hi, Thank you for the great info you have shared here. Just one question is Hero session with Gimbal a better option than 5 session alone for more stable videos? In terms of stability, when used properly an external gimbal will nearly always outperform the in-camera software stabilization. I've been meaning to do post some practical examples--hope to get to that soon. I am interested in doing some slow motion video, to view a machine I am building. Which would be best for this, I need good resolution also. Because it offers higher frame rates, the HERO5 Session will offer more options for slow motion. But both are very capable of good slow motion footage. I am wanting to use a go pro in order to record sports videos like football, cricket and golf the camera will be still a lot of the time. Also, i do some cycling but i am not too worried about stabilisation as it could look better to see all the bumps. I also wanting to use it in water so in pool or the sea. I am on 14 so don't have loads of money therefore i am edging towards the go pro session. Which do you think i am better off getting? The HERO Session is a very good option, especially if you don't need the stabilization. For the things you describe, you'll get some great footage for it. The HERO5 Session does have more bells and whistles, but I suspect you'll be very happy with the HERO Session. 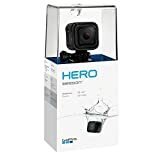 If you happen to be able to find the HERO4 Session discounted, that's also the same camera but some places might be selling it cheaper because it's technically an old model. Hero 4 Session, besides it's recording abilities being fantastic, the software on this thing is bull-honky. I shouldn't expect much from a 2"x2"x2" cube but still; this thing gave me an aneurysm trying to connect to my computer rather than the app for previewing the camera. On top of that I went on a wild goose chase trying to understand this thing. What a waste of time. This thing definitely does its job though. I am an expert skier and I am torn between the HERO5 Session and the HERO Session. I would mostly be shooting video in powder. One thing that intrigues me about the HERO5 Session is the stability control. Is that aspect of the HERO5 Session worth the extra money compared to the HERO Session? Have you talked to any skiers that have liked one camera over the other? Not sure about which skiers prefer, I'm afraid--I'm definitely not an expert skier--so I can't speak to that specific use. But more generally... The in-camera stabilization isn't perfect, but it does work reasonably well and makes a real difference. I have some examples here (none skiing). The picture quality (stills and video) is better on the HERO5 model. And the voice activation mode might be useful for times when your hands are otherwise engaged as you race down a mountain. Again, it's not perfect, but it can work well in the right circumstances. I bought a GoPro Session for my son, recently. Will the accessories for this model be the same as GoPro Session 4/5 ? I am talking about things such as aluminium frame, tempered glass protector? I was on Amazon and to be honest, it's quite confusing. Yes, nearly all the accessories for the Session will work with the HERO4 Session and HERO5 Session, and vice versa. The HERO5 Session uses a different cable, and the HERO Session doesn't take external microphones, but pretty much everything else will work. Great review, I'm still torn between models. I am looking to take the GoPro paddleboarding with me mounted to my paddle. It seems both models will handle it just fine. Do you think it's worth the extra $100 for 4k? Mostly I will post the pics or video to Instagram? They'll both work well for that and, especially if you're using it for still photos, you'll get some great shots with either of them. I don't paddle board, but I do kayak, and both work well. Much of the time I find I don't use 4K for everyday shooting. The in-built stabilization can improve things for video, but it can also give inconsistent results in some settings with non-standard movement. One feature that might come in handy if you want to film while paddling is the voice activation. You can simply say "GoPro take a photo" instead of taking your hands off the paddle to press the shutter. Again, this feature isn't perfect, but it should work well for the close range of paddle boarding. I have an 8 year old who has asked for a video camera. These look like the best fit for him with the simple set up. If you were an 8 year old who wanted to make short films which would you enjoy the most? The entry-level GoPro Session is a good option. As is the Polaroid Cuba, which is quite similar, a bit cheaper, but doesn't have the same very extensive range of accessories available. For the basic pointing and shooting, they're both simple to use (my 4-year-old does it). Taking the footage from the camera and then turning it into something you can share involves a few extra steps, but they're very similar for that. There's another one that's designed specifically for kids that looks interesting (this one). I haven't tried it yet but plan to have my kids try it out as things warm up for summer activities. It seems pretty indestructible and has a screen on the back. I suspect the video quality isn't very good, but that's not usually high on the list of things kids care about. Any of them will work, but I find that the screens on the back of the HERO5 Black and HERO4 Silver come in very handy when using them as everyday cameras for things like travel. It's also useful to be able to swap out batteries with spare charged ones--something you can't do with any of the Session models. Memory card size is entirely dependent on your shooting habits. If you're shooting photos, you have a lot more leeway because it takes a lot of photos to fill up a card. You can get at least 8,000 photos from a GoPro on a 64GB card. If you're shooting a lot of video, it chews through the space much more quickly--at 4K30 you can fill up a 64Gb card in a couple of hours. Here are some more specific tables on this. You might also find this post on pros and cons of GoPros as everyday cameras useful. Is it good idea to use GoPro Hero Session as a dashboard cam in a car? Is it possible to loop recordings? You can, but they're not especially well-suited to that type of use for long-term use. You can run external power via USB and there are plenty of mounts that will work on a dash or windscreen. They do have a loop function that overwrites automatically. You can set it to a specific time (like 60 mins) or when the memory card is full. Dedicated dashcams also often have extra features that help them put up with use all day every day. If you're primarily using it often as a dashcam, you're probably better off looking at one of the dedicated dashcams--and many of them area also much cheaper than a GoPro. If you're only using it like that occasionally, then yes, they can work quite well. I'm curious if you've noticed any difference between the session 4's wind-noise elimination and the session 5's advanced wind noise elimination. To be honest, on-board sound isn't usually my highest priority when shooting with GoPros, so it's not something I've focused on. But I had penciled in precisely this kind of side-by-side test and will move it up the queue. Thank you for your thorough reviews, I started with this Session Vs. Session 5 article, and have since read many others. My last reservation regarding the Session 5 is the installed battery and the per charge endurance and overall lifespan issues it has. I am planning on using my Session on a helmet mount for extended, cross country motorcycle rides. I know that the installed battery will not even outlast a tank of gas, but I am wondering if you have any specific recommendations for running on a power bank? Are you aware of any power banks designed for helmet mounting? Is the GoPro brand any better or different? Is there an after market "boot", or adapter that will cover the open battery/SD Card door? Are there cables that might be lower profile than the supplied USB cable, which sticks an inch out the side door? Any help would be greatly appreciated. Good questions, but I don't really have any good answers. In terms of external batteries, it will work with pretty much any of them. But as you note, the catch is the mounting of them--first to be low-profile for the helmet and then weather-sealed on the battery end as well as the camera end. Compact ones like this or this will work well for the powering side of things, but it doesn't solve the profile or weather-proofing problems. Others have done DIY hacks (different type of helmet but similar idea) but I haven't personally tried them with a helmet. I'm not aware of any camera hatch doors that would add a reliable seal while the cable is connected, but DIY solutions ranging from duct tape to modifying a dive housing might work. Hi, will the hero 5 session lens cover fir on the hero 4 ? On the HERO4 Session? Yes. On the HERO4 Silver or Black? No. Ah, I misunderstood. I didn't realize you meant the actual lens port. It should work, but I haven't tried it and can't say for sure. Thee was an issue with some SD cards causing the camera to drain battery when off. It has to do with how the camera scans the card. If there is an issue the camera continues to scan until the battery is dead. Unfortunately, SanDisk cards were notorious for causing this issue. GoPro worked with SanDisk and fixed this with a firmware update. When the camera is turned off Bluetooth remains on for eight hours. All other modes are off. The Bluetooth drain is minimal and has virtually no effect on the battery charge life. If you are on the latest firmware (always update your devices to the latest firmware updates) and still having drain issues, try a different SD card (make and model). Hey! Amazing article, I find it quite helpful. I have only one question. If I were to get the HERO5 Session but I am not intending to shoot a 4K video, do I still need to get a faster memory card. I'd recommend it, because it's not just the 4K video that uses the fast data rate. Some of the lower-resolution sizes but with fast framerates also require it. Hi, great write-up. I noticed one typo that may confuse readers. "Video Modes Compared. The HERO5 Session also offers a wide selection of resolutions and framerates, including 4K video, that the HERO5 Session doesn’t have." I think you mean "that the Hero Session doesn't have." Problem with the session 5 is that one can't take time lapse night photos as the only shutter options are 2 and 5 seconds whereas 20 or 30 seconds are required. I've not run into that issue with this model but will try to test this specifically over the next few days. I have run into the issue with older models of GoPros. A common culprit is wifi being left on--it drains the battery even if the camera is powered off.